The calories “hidden” in many drinks can destroy your attempts to lose weight. Sadly, many drinks that may sound or look healthy are actually full of empty calories. These calories usually come from sugar or unhealthy fats that have little (or usually zero) nutritional value. Here are some tips to help you make sure these potential diet-busters are actually healthy. Many bottled iced teas contain lots of sugar. Don’t drink these empty calories. 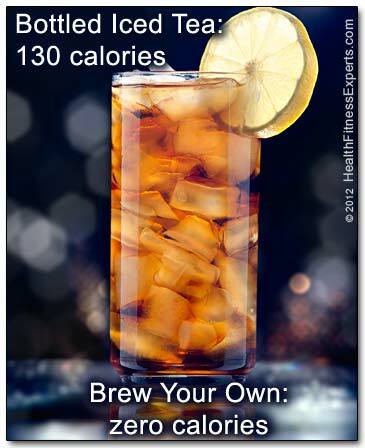 Brew your own zero calorie iced tea. Tea is actually one of the healthiest drinks on the planet — especially green tea. It’s full of life-extending antioxidants and other beneficial ingredients. That’s why you’ll find all kinds of tea drinks out there. But watch out. Most bottled tea drinks are loaded with sugar. And often, they have very little actually tea in them. Check the labels carefully. A typical bottle may have 30 to 60 grams of sugar. That’s 120 to 240 empty calories that you don’t need! Plain tea actually has zero calories. That’s right, zero calories! You can brew a large batch yourself and pour it over ice or stick it in the refrigerator for later. Choose green tea, because it will boost your metabolism and help you burn some extra fat. But what if you don’t like the taste of green tea? Try adding some lemon. Or, try a naturally flavored tea. Bigelow and other brands make green tea enhanced with natural flavors, like wild blueberry, mango, pomegranate, lemon, peach, or mint. They even make K-Cups that you can use in your Keurig! “Enhanced” water can be found in many varieties. It’s often enhanced with vitamins and it’s usually packaged in trendy bottles that promote its health benefits. How could you go wrong drinking a bottle after great workout? The unfortunate truth is that vitamin water usually contains a sizable dose of sugar and other not-so-healthy additives. That’s ridiculous — no one should be drinking sugar water! That can cost you 50 to 200 calories per bottle. If it doesn’t contain sugar, it likely contains artificial sweeteners. Yuck. Why would you want to drink that? And to make things worse, enhanced water is not cheap. It typically goes for $2 to $3 per bottle. The solution? Avoid enhanced and vitamin water and stick with plain or sparkling (carbonated) water. Don’t like plain water? Try enhancing it yourself with a squeeze from a lemon, lime or orange slice. If that’s too messy or inconvenient, try crystallized lemon. You can buy it in easy to use single serving packets, and most brands are all natural with zero calories and zero sweeteners. Smoothies: An Unexpected Calorie Overload! Full of antioxidant berries and perhaps some dairy products, a fresh fruit smoothie sure looks and sounds like a healthy drink choice. But it’s usually not! If you got it at a smoothie shop, chances are good that it’s loaded with empty calories. The biggest culprit is sugar. Most smoothie shops use fruit concentrate instead of fresh fruit. That boosts the amount of unhealthy sugar while lowering the amount of healthy fiber and antioxidants. If they use ice cream, or sorbet, you’re getting even more sugar. So your seemingly “healthy” drink can quickly end with 75 to 100 grams or more of sugar. That’s 300 to 400 calories! Ouch. But not all smoothies are created equally. You can get a healthy smoothie if you can make your own or if you can find a more health-conscious shop. You should make sure the smoothie is made with only fresh fruit – no concentrates and no added sweeteners. If you want to sweeten things up, add a ripe banana. That will add some sugar, but also lots of fiber and potassium. You can also boost the nutritional value by adding some protein powder, non-fat milk or yogurt. You’ll quickly turn those empty calories into meaningful ones! It’s a battle to keep down the number calories that you eat. Don’t wreck your efforts by drinking calories that you don’t need. Make healthy choices by avoiding drinks full of empty calories in favor of low or zero calorie drinks. Our favorite choice is pomegranate flavored green tea over ice: super refreshing with zero calories and lots of health benefits.